Adamvs was was formed by Denise Adams and Stephen Adams in 2008, when they purchased a parcel of vines on Howell Mountain. They were already experienced vineyard owners as they already owned 2 vineyards in the Right bank of Bordeaux, Chateau Fonplegade in St. Emilion and Chateau LEnclos in Pomerol, as well as a property in Healdsburg. Adamvs, takes its name from a play on words. It’s similar to the couples last name of Adams, and it’s also Latin for born from the red earth. Also, as a tip, don’t get confused by the spelling, the name of the winery is pronounced as Adam-Us. What we know of as Adamvs today had been a working vineyard for quite a while. Previously, it was known as White Cottage. Once Densie and Stephane Adams took control of the property, they brought in Philippe Melka to consult and Michael Wolf to help in the vineyards. 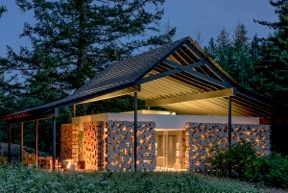 The 76 acre Adamvs vineyards and winery are located high up on Howell Mountain. They have good neighbors. They are close to the vineyards of Dunn and O’Shaughnessy. The Adamvs estate has 28 acres planted with vines. 25 acres of those are devoted Cabernet Sauvignon. The remaining 3 acres are planted with Sauvignon Blanc. The Adamvs vineyards can be divided into 5 separate soil types and elevations that range from 1,500 feet to 2,000 feet above sea level. The soils at Adamvs consist of white volcanic ash with gravelly loam, red iron-laden soils of clay and volcanic rock and various types of loam all located on the hillsides of Howell Mountain. Like all the properties owned by Stephan and Denise Adams, the vineyards are all 100% biodynamically farmed. At Adamvs, harvesting is done on a parcel by parcel basis. 80% of the wines are fermented in stainless steel tanks. The remaining 20% of their grape are vinified using micro vinification techniques. Adamvs produces 3 Cabernet Sauvignon wines and one Sauvignon Blanc. Adamvs Cabernet Sauvignon is their top wine. Produced from 100% Cabernet Sauvignon, the wine is made from a selection of their best barrels. The wine is aged in 100% new, french oak barrels for 22 months before bottling. Not much is made. The average annual production is slightly more than 150 cases of wine per vintage. Adamvs Quintvs Cabernet Sauvignon is made from 100% Cabernet Sauvignon. The wine is aged in 100% new, French oak barrels for 22 months before bottling. The average annual production is close to 600 cases per year. Adamvs Cabernet Sauvignon Teres is produced from 100% Cabernet Sauvignon. The wine is aged in 80% new, French oak barrels for 22 months before bottling. On average, slightly less than 1,000 cases of this wine are produced each year. Adamvs Sauvignon Blanc – Produced from 100% Sauvignon Blanc, the wine is barrel fermented and aged in 30%, new, French oak for 15 months before bottling. The production is on average slightly more than 100 cases per vintage. Adamvs is best served at 15.5 degrees Celsius, 60 degrees Fahrenheit. The cool, almost cellar temperature gives the wine more freshness and lift. Young vintages can be decanted for 1-3 hours, depending on the character of the vintage. This allows the wine to soften and open its perfume. Older vintages might need very little decanting, just enough to remove the sediment. Adamvs is best served with all types of classic meat dishes, veal, pork, beef, lamb, duck, game, roast chicken, ribs, hamburgers, barbecue, roasted, braised, grilled dishes and stews. Adamvs is also good with Asian dishes, hearty fish courses like tuna, salmon, mushrooms and pasta. Sauvignon Blanc, the white wine of Adamvs is best served with all types of seafood and shellfish, sushi, sashimi, chicken, veal, pork and cheese. With a deep, dark color, the wine displays a beautiful nose of flowers, black fruit, a touch of oak, licorice and spice. The wine is a definite teeth stainer in all the right ways, finishing with a big blast of lush, fresh fruits, sweetness, length and purity. Tight, needs air and time before the freshness and purity of the fruits start to show their character. Full bodied, concentrated and deep, there is an elegance to the powerful tannins which says a lot about Howell Mountain fruit. Big, balanced and powerful, this needs to lay down before it’s civilized. Medium/full bodied, with a flashy nose of boysenberry, cocoa and chocolate. The wine is packed with fruit, soft, plush textures and a smooth, soft, fresh, ripe fruit filled finish. It is hard to believe this comes from 100% Howell Mountain fruit, because it is so lush, and polished. But it does. Using 100% Cabernet Sauvignon, planted high up, above the fog line at 2,000 feet, the wine is concentrated, with depth of flavor, complexity and richness. Inky in color, and still young, you can easily pop a cork and drink this today, or age it for a decade or more. This is the flagship wine from the Adams family. The wine is a blend of the 4 best barrels from the vintage. Flamboyant nose of flowers, boysenberry, cocoa, vanilla and smoke on the nose pop with no effort. The wine has a soft, polished, fresh character, with ripe tannins and a smooth, lush, chocolate covered blackberry finish. Lush fruits with a real sweetness to the blackberry center, polished, but persistent tannins giving you the backbone to age and a round, dark fruit filled, fresh finish. The wine was made from a blend of 93% Cabernet Sauvignon and 7% Merlot. Medium bodied, forward, fresh, easy drinking Cabernet Sauvignon with a short, sweet black cherry finish. Dark ruby in color, with a spicy, dark chocolate and blackberry profile, ending with a piquant, dark cassis finish. Good ripe fruit, lots or licorice, vanilla, blackberries and jam also appear in its forward style. There is a touch of dryness to the tannins in the finish. The nose is on the floral side, made even better with the addition of fresh picked blackberries. Full boded, rich and fleshy, the finish delivers sweet and tart, black cherries. Earthy, smoky, black cherry nose, paired with one of the few wines made from young, approachable mountain fruit that finishes with fresh, blackberries, licorice and cassis.